Pound for pound, the most dangerous animal in the world when wounded, drawing a deep respect from all who have hunted this magnificent creature. Elusive and dangerous are the first thoughts any hunter should have when leopard hunting…! Leopards are thought to date back as far as 2 million years which is testament to their perfected ability to adapt in all aspects. They are the perfect predator, opportunistic hunters and incredibly strong for their size. In the heart of a leopard lies the knowledge and instinct of its inner strength, which are not often exhibited - unless wounded or cornered. If not hurt or wounded, a leopard almost always prefer flight over fight. Leopards are usually solitary, holding and protecting a large territory which is roamed in its entirety on a regular basis. They are extremely cautious with excellent senses and camouflage. The perception that leopard are few is testament to this fact. Males are larger bodied with a broader head and generally a darker, yellowish-orange tinge to their coats, especially along the top of their back. They are largely nocturnal and hunt a wide variety of prey from medium-sized antelope down to frogs and mice. They are extremely adaptive and are able to live in a variety of terrain, making them widespread throughout Africa. Leopard are not really known as man-eaters although there are cases in Africa and India where these cats have turned into impressive human predators - the "Leopard of Panar" which was shot by that most famous of cat hunters, Jim Corbett, killed over 400 people. Leopards have a very wide range of habitat tolerance, from rainforest to semi-desert, including savannah, mountainous areas and rocky hills. Leopards naturally occur in most parts of the African subcontinent and many parts of Asia. Leopards lead a solitary lifestyle. Males inhabit territories of 5 to 40 square km, which may overlap with the territories of several females. They are very defensive of their territory and urinate around the boundaries of their territories to warn off intruders. They are most active between sunset and sunrise. Leopards often take their kills up into the safety of tree branches, to avoid the attention of hyenas and lions. They are incredibly strong and are capable of lifting carcasses three times their own body weight, placing them on branches over 6m high. There have been several reports of leopards hauling young giraffes into trees. Due to their secretive nature it would be very difficult to successfully hunt leopard on a 14 day safari without baiting or dogs. Baiting is the most common method due to lower cost and due to more permits available. Hunter and PH will wait in a blind, normally at dusk , 50 or more yards away. Quality optics with strong light gathering capabilities is necessary. 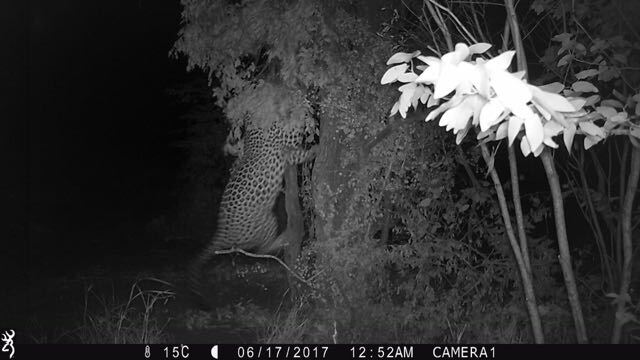 Take note of how the leopard is sitting on the bait and listen to your PH's advice as to where to aim for. The older hunters believe : "If you can hear the cat hit the ground, it has been shot well ". The most common mistake is to miscalculate the angle of the shot as you are shooting up into a tree and usually you need to aim slightly lower. Leopard frequently walks through easy corridors, such as riverbeds and roads. Thick cover or rocky outcroppings provide them with secure daytime hangouts and good ambushing points for hunting. Due to the animals reclusive nature successful leopard hunters will book a minimum of 14 days on the ground in the hunting area. Available meat "bait" is strategically secured to a climbable tree in an area the leopard frequents. The scent of guts and stomach contents, along with blood and decaying flesh attract the cat to the bait. The bait is typically in the dense area or thicket, close to the leopards favourite travel routes. The dense bush helps the cat to feel secure and encourages him to feed in daylight hours. A blind is built on active bait! Blind location is dictated by terrain and wind direction. The approach to the blind is also very important. We take great care to look after all these important details. Shots are typically 50-70 yards and are from a set position. Accuracy is very important for leopard hunting. You will have one shot. More often than not, a wounded leopard will charge. They are very fast and can cause a hunter a lot of stitches in a very short amount of time. Trophy size is dictated by skull size. Weights of the cats fluctuate greatly and are often exaggerated by hunters. Overall length of a cat is often discussed by hunters and is not usually reliable information. Leopard are CITIES I animals and are allowed to be imported to the United States. Hunting quotas are strictly issued and a limited number of tags are available for leopard hunting. Hunting with Dogs ultimately give hunters a better chance to harvest a trophy leopard. Your PH and Dog handler will do their utmost to get your trophy leopard. Usually, you will have a slightly better chance if you hunt prior to September as the Blue tick hounds can smell better in slightly wet grass. The first step is to hang baits and to try and pick up fresh tracks and leopard activity. Once activity has been determined, roads are branch dragged late afternoon to wipe out old tracks. Your hunts will then start around 3 am in the mornings looking for fresh tracks. Once found dogs will be released and and it is now up to the dog handler and his pack of dogs to find the leopard. Dogs are well trained and the Dog Handler listens to different way of barking and howling which will tell him how the dogs are making progress. Dogs are also smart enough to tell an old scent from a fresh scent. Sometimes it can take hours to get on the right track, but if you are patient things normally work out and the hounds manages to track down the leopard. Hunters need to be able to at least walk/jog at a good pace so they can catch up to the dogs once the dogs have bayed the leopard. Size: Shoulder height 30 inches, male weigh around 150 to 180 lbs. Size can vary depending on the area. Females are typically 20% - 40% smaller than males. Color: Ground colour is off-white to golden, with black spots on the legs, shoulders, head and hindquarters, and irregular, light-centred 'rosettes' scattered profusely over the back and sides. Most Like: Leopards are most like the Cheetah, but the leopard is heavily built and has no tear marks from corner of eye to corner of mouth. The leopard's main body markings are rosettes and not solid spots like those of the cheetah. Diet: They have a number of prey items, including gazelles, antelopes, monkeys, jackals, duiker, eland, impala, insects, wildebeest, rodents, hares, peacocks, snakes, sheep and goats. Leopards can live independently of water for long periods of time, obtaining liquid from their prey. Reproduction and Gestation Period: The Leopards gestation period is between 90 - 100 days (3 months). Which country is best suited for your Leopard hunt? What can I afford to spend on my leopard hunt? What do I want out of my leopard hunt? Will I be hunting other plains or dangerous game while I am on my leopard hunt? Baiting method only. Leopards are hunted mostly in the Central and Northern Namibia Camps. Predator trophy hunting may not take place during the period between 30 minutes after sunset in any day and 30 minutes before sunrise the following day and artificial light is prohibited. Only free roaming, self-sustaining and adult predators may be hunted as trophies with a minimum skull measurement of 32cm for a Leopard. A female Leopard may not be hunted as a trophy. A predator may be stalked, tracked or ambushed, but dogs or horses may not be used to hunt it. Live animals may not be used as bait. Our 14 day Leopard and Plainsgame hunt involves a day fee of ($1200+15%VAT/day) for a 1 on 1 leopard hunt plus a refundable leopard trophy fee of $5,800. If you do not harvest the leopard, you only pay the day fees. Total costs are therefor approximately $27,000 to $30,000 for a 14 day leopard hunt. Day and trophy fees included. Cats from 150 to 180 pounds. 80% Success with Bait and 90% with dogs. 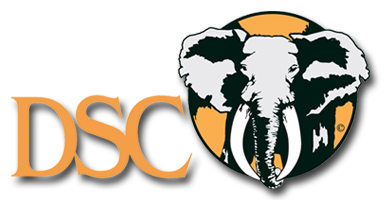 The Conservancy in South Eastern Zimbabwe is the largest privately owned reserve in Africa. The concession is renowned for magnificent leopard, buffalo and plains game trophies and home to the Big Five.Clients will have exclusive access to 100,000 acres within the unspoilt African Bushveld. The area that has a very healthy and diverse range of species. Plains game species include: Zebra, Kudu, Waterbuck, Sable, Eland, Nyala, Wildebeest, Giraffe, Impala, Bushbuck, Warthog, Bush Pig, Duiker, Klipspringer and Baboon, as well as the nocturnal species.Record quality trophies are taken annually. A 14 day leopard hunts on bait in this area will cost between $27,000 and $30,000. Hunting with hounds will add another $6,500. The camp is comfortable and has all the facilities that you can expect from nice camp in Zimbabwe. Big cats from 160- 180 pounds. 75% Chance with bait. Hunts are conducted on baiting method only. This is a dangerous game and exotic species area . The area boasts itself for Buffalo, Lion, Leopard (major species), Elephant, Roan Antelope (major Species), Lichtenstein’s Hartebeest, Chobe Bushbuck, Kudu, Buffalo, Leopard, Lion, Crocodile and Hippo. A 14 day leopard hunt will cost you between $22,500 and $40,000. This includes daily rates and trophy fees. Charter flights from Lusaka to hunting area is $2,500. Most hunters add a 2 night 1 day Kafue Lechwe hunt for approximately $4,000. It is also possible to add a 7 day safari to your leopard hunt that include hunting the Kafue Flats and Bangweulu Swamp area where the following exotic species will be on your quota: Zambezi Sitatunga, Black Lechwe, Tsessebe, Common Reedbuck, Oribi and Kafue Lechwe. - Guided "1x1" $11,500 p.p. 67% Chance. Baiting method only. Leopards are hunted mostly in the Limpopo province in and around the Waterberg Mountains in South Africa. In most cases if you are after leopard and plains game on a 14 day hunt with a limited budget, we would reccomend hunting the Limpopo. Costs are approximately $25,000 to $30,000 for a 14 day hunt. 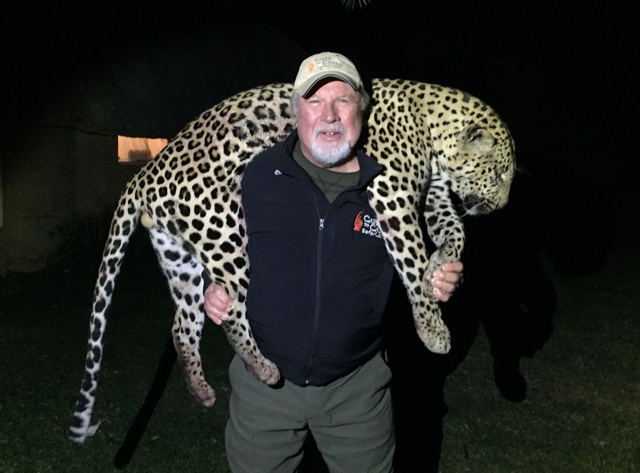 Day and trophy fees included.The South African Law still allows hunting at night and therefor you have a better chance to harvest your leopard in South Africa than Namibia. Cats are from 130 to 170 pounds.